This week, we’re listing our most popular posts published this year as determined by the number of views. Did your favorite post make the list? Thank you for your continued support by subscribing, reading and sharing our work, and buying our books. If there’s anything you’d like to see more of, let us know in the comments. We’ll be back next year with more great content. And now, without further ado, our most popular posts of 2017. 1. The Fight for Mindoro As a result of some great comments from a prior post (see #4 on this list), we delved into further detail about a harrowing mission on December 24, 1944. 3. Book Review: They Did It for Honor: Stories of American World War II Veterans We review the second book of veteran stories as told to Kayleen Reusser. (tie) Beyond the Bomb Group What happened to the B-17s that transferred out of the 43rd Bomb Group? 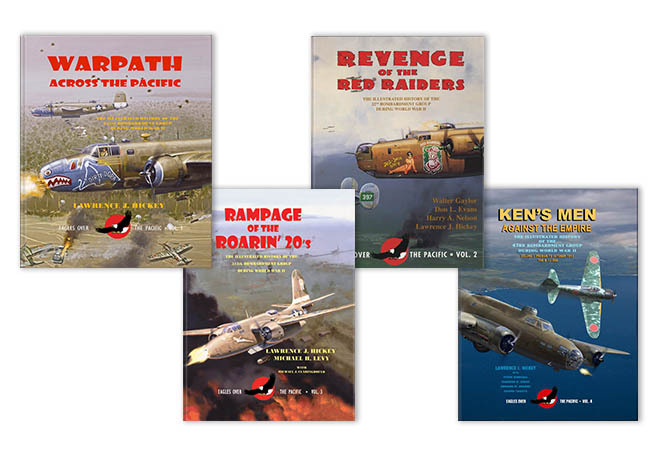 We follow the story of one of their old Flying Fortresses, CAP’N & THE KIDS. 4. Night Action Off Mindoro This dramatic painting by artist Jack Fellows illustrates a B-24 coming off an attack on a Japanese destroyer near Mindoro. 5. Major Tom Gerrity’s One Plane War Against the Japanese A pilot scheduled to go home wanted one more crack at the Japanese before he left the Pacific Theater. 6. 9 Photos of Dogs in the Pacific Theater During World War II It’s all in the title. Go meet some of the dogs of Fifth Air Force. 7. One Minute in Hell Steve Ferguson illustrates some of the final moments of 1/Lt. James A. Hungerpiller and his crew over Simpson Harbor on November 2, 1943. Two airfields were constructed on Mindoro within 13 days of the Allied takeover in preparation for the invasion of Luzon. Admiral Masatomi Kumura did not want to see these airfields become usable by the Americans and he assembled eight ships to sail from Vietnam on December 24th to Mindoro in hopes of disrupting the building efforts. It wasn’t until the 26th that their presence was detected some hours south of San Jose and U.S. ship crews hurried to vacate the harbor before the arrival of the Japanese. Men at Mindoro’s airfield sent a message to Tacloban asking for any help they could get to defend their new airbase. Unknowingly, the Japanese had picked the perfect moment to strike. The two airfields were almost out of resources, with only a couple dozen bombs and anemic fuel stocks. 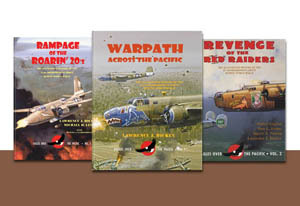 The air units present on Mindoro (the 8th and 58th Fighter Groups, and the 110th and 17th Reconnaissance Squadrons), were flying fighter aircraft, except for the 17th, which had B-25s. None of these aircraft were capable of tangling with a cruiser safely, and even if they were, none of the crews were trained for night-flying operations. And the U.S. Navy, which had previously been in charge of protecting this advance base, were a day’s voyage away. The worst-case scenario was invasion. If the Japanese force successfully landed infantry, San Jose would certainly have been overrun. Therefore, every available plane was mobilized, despite the lack of ordnance, the mismatched combat capabilities and the darkness. (There were no landing troops aboard these ships, but the Allies didn’t know that.) Since the fields on Mindoro had to stay under blackout conditions, the aircrews were told to land at Tacloban, almost 300 miles to the east. At 2100 hours, the Japanese ships were in range, and over 100 American aircraft scrambled. Among them were two aircraft that had responded to the distress call: B-24 snoopers of the 63rd Squadron, 43rd Bomb Group. The 63rd was a night operations group, and two of their aircrews, headed by 1/Lts. Dickinson and Samuel L. Flinner, happened to be in Tacloban when the distress call was received. They had been ordered to make multiple passes from 6000 feet and drop one bomb at a time in order to make it sound like multiple B-24s were overhead. Instead, Flinner dove down to 1000 feet while strafing the light cruiser Oyodo to drop his bomb more accurately. It looked like his bomb knocked out a couple of the heavy guns aboard, and Flinner went to pull away for another run. Except he couldn’t. PUG’s rudder cables were completely severed by antiaircraft shells and Flinner’s tail gunner was wounded. The B-24 began to descend, nearly hitting the water before Flinner regained control of the plane. He salvoed his remaining bombs and turned for Tacloban. Dickinson, meanwhile, made his runs and damaged the destroyer Kiyoshimo with two direct hits. Once the crew was away from the fighting, they set about administering first aid to the tail gunner and the engineer, T/Sgt. Bill Schlereth, tackled the rudder cables. He found the two ends of the severed cables in the large mass of wires overhead, then enlisted Sgt. Don Tuley to help him isolate them. Schlereth spent the remainder of the flight clamping and reweaving spare wire to the rudder cables to the point that Flinner was finally able to control the rudders for landing. They waited out an additional five hours by circling Tacloban in order to burn off fuel and make a daylight landing for safety’s sake. In the end, PUG landed safely with more than 200 new holes than she took off with. The groups at Mindoro had suffered severely: three B-25s, 10 P-47s, six P-40s, and seven P-38s had been lost during the battle. The Japanese withdrew from the area around midnight after doing little damage to the airstrip and harbor with one less ship, the Kiyoshimo, which had been severely damaged by Dickinson’s crew. If you want to read about the battle from the ground perspective, check out Rocky Boyer’s War. On the night of December 26, 1944, this radar-equipped B-24M night intruder, piloted by Lt. Samuel L. Flinner of the 63rd Bomb Squadron, 43rd Bomb Group attacked and immobilized the Imperial Japanese Navy Yugumo-class destroyer, Kiyoshimo, off the Philippine island of Mindoro, where it was left behind and sunk by a PT boat. Leaving Tacloban, they had been informed that a Japanese task force might try to retake the area so orders were given to try to locate it. After departure, they skirted a squall line only to find that Mindoro’s night sky was being lit up by shelling and flares. Scouts for ships with radar produced several targets. While being showered with heavy tracers and antiaircraft fire, a low altitude bomb run at 1000 feet was made on a vessel that was three miles off shore. All three of their bombs produced large explosions. After the run on the ship, the B-24 became the center of attention for the Japanese as it dove to the deck in a hard turn. Two shells hit the plane, one in the tail turret, injuring the tail gunner, and another exploded in the midsection behind the waist gunner, cutting the rudder cables. Splicing the cables together, they flew back through the squall line to Tacloban and circled until daylight to land. A ground inspection revealed over 200 holes. Lieutenant Flinner accumulated 24 missions and 412 combat hours. He and his crew were given credit for the kill. This artwork will be published in our next book Ken’s Men Against the Empire Volume II. Buy your copy of this dramatic artwork by aviation artist Jack Fellows on our website.